The small Scottish nation has left a big mark on the planet, and the Scots are well aware of it! Proud and easily hurt, kindly and bellicose, prudent businessmen and wild gamblers, producing some of the best food in the world and eating some of the worst, bigoted and free-spirited, tightfisted and generous-hearted—the Scots are nothing if not contrary. 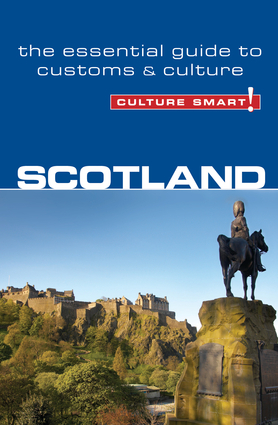 This book will show you how the geography of the country has shaped the Scottish people, in all their variety. It explains why their history is important to them, and gives an insight into their values and attitudes, their home life, their business practices, their faults and virtues, their world view and beliefs. It offers practical advice on what to expect and how to behave in different circumstances. Whilst there are certainly important differences in character between Highlanders, Lowlanders and Glaswegians, there are also national traits that are held dear by all. The typical Scottish man or woman of today may be a busy townie with the usual communications and labor-saving paraphernalia of the twenty-first century, but the simple communal life and the quiet, old-fashioned, religious ways of the tall, relaxed, slow-speaking Highlanders—their music, their Gaelic heritage, and the awe-inspiring beauty and stillness of the Highlands—are idylls profoundly embedded in the Scottish psyche. If you show a real interest in their lives, if you are honest and “your own man” (or woman), and if you respect their sensitivities, you will find the Scots as affable as they have long been known to be. In contrast to this English reserve, the Scots see themselves as friendly, down-to-earth, and open. They say what they mean and they mean what they say. Their straightforwardness should not be considered confrontational however.